What do you study when you study “logic?” Logic is a subject much like math. Math has several departments such as arithmetic, algebra, geometry, and trigonometry. Logic also has many branches, all under the big heading of “logic.” The branches on the tree of logic cast a broad shadow. Some are easy to understand and apply, like addition or multiplication in math. Others have difficult concepts to understand, like calculus or quantum mechanics. Don’t expect to understand all the terms and subjects we’ll introduce in this article. This is a high altitude photograph of the subject of logic – it will give you the overall picture. At the beginning, logic can be divided into formal logic and informal logic. This is similar to the difference between standard math and “consumer” math. Formal logic consists of the abstract rules and theory of logical reasoning that logicians have developed over the years. Informal logic is the practical side of the coin and consists of methods for analyzing verbal arguments to see if they really prove their point. Informal logic teaches decision-making skills and quick methods for detecting bad reasoning. You need to learn formal logic to understand the foundational principles that you will use in the more practical informal logic. Law of Identity: if any statement is true, then it is true. Law of Non-Contradiction: no statement can be both true and false at the same time and in the same sense. Law of Excluded Middle: any statement is either true or false. Formal logic splits into two fundamentally different types of reasoning: deductive and inductive. Deductive Reasoning is the logic of proving things for certain. With deductive reasoning, you can begin with a few true statements, and then deduce more statements that you know are also true. You can also analyze arguments to see if they are valid. The two major types of deductive reasoning are traditional Aristotelian logic and modern symbolic logic. 2. Modern Symbolic Logic is another method of deductive reasoning developed after the seventeenth century. Gottfried Leibniz and other logicians had a vision for a more simple and useful method for translating ordinary reasoning into a universal language of symbols. Among other things, this method can more quickly analyze longer arguments to see if they are valid. This method of deductive reasoning made logic even more “mathematical.” It also made it uglier. This branch of deductive reasoning has many sub-branches. Computer programming is one branch of modern symbolic logic. Inductive Reasoning is an entirely different form of reasoning from deductive reasoning. While deductive reasoning proves things for certain, inductive reasoning evaluates the evidence to determine whether an argument is probably true or false. Since it is not always possible to prove something for certain, logicians developed principles to reason from the evidence in a way that arrives at useful conclusions. We see the benefits of this scientific reasoning all around us in our modern technological world. Sir Frances Bacon was a leader in developing this form of reasoning. Analogy builds arguments based on similarities between two things. Generalization reasons from one fact to all similar facts. This is the basis for all scientific reasoning. Mill’s Methods for Experimental Inquiry were developed by John Stuart Mill to investigate the causes of scientific phenomena. Hypothetical Scientific Reasoning is used when scientists form theories about the world and test their theories with experiments. Statistical Reasoning creates and interprets statistics about our world and draws conclusions from those statistics. Probability is a science closely related to statistical reasoning. It tries to predict the future based on our knowledge of past experiences. None of these six methods of inductive reasoning can ever prove any idea for certain, but they sure come in handy sometimes when inventing things like light bulbs and digital cameras. Informal logic is the technical name for what is called Critical Thinking in modern high schools and colleges. This modern branch of logic tries to take formal logic and, by intermingling it with Rhetoric, make it into something more palatable and useful. Language plays a fundamental role in reasoning. Understanding how language influences our reasoning is foundational to understanding reasoning itself. Classification is the organizing of different things into separate classes according to similarities and differences. This helps us understand the relationship between things. Definition describes what a word means by genus, species, and differentia. Noah Webster used this in his 1828 dictionary. Argument can be divided into: (1) Recognizing Arguments – what you need to do before you can evaluate them critically; (2) Argument Diagramming – a neat method for laying out reasoning in a visual way; (3) Argument Evaluation, which includes general methods for analyzing what other people say; and (4) Argumentation, which includes methods for creating your own logical arguments. Problem Solving is the method for solving complex puzzles. Logical Fallacies are common errors that we make in reasoning. Practical logicians have tried for thousands of years to teach ordinary people how to recognize these logical fallacies, but apparently to little avail. (We logicians feel very frustrated about this.) There are two types of logical fallacies: formal fallacies, which are violations of the rules of syllogisms, and informal fallacies, which are familiar forms of bad reasoning that you might hear in ordinary conversations. On an everyday basis, we believe the study of logical fallacies is the most useful part of logic. Some fallacies, which could be called Propaganda Techniques, such as, “Elizabeth Taylor likes this perfume, so you should, too,” are what you see on TV and hear from politicians every day. Some of these branches of informal logic overlap into Rhetoric, but for practical teaching purposes, they can be included under logic. The subject of logic is surprisingly like the subject of mathematics. There are many branches; some are useful to ordinary people, and some are not. Some branches are easy to grasp, and other branches only dusty headed professors who inhabit obscure halls of learning can really comprehend. Some parts are fun, such as logical fallacies, while others, such as the higher reaches of modern symbolic logic, were invented for geeks to enjoy in blissful solitude. 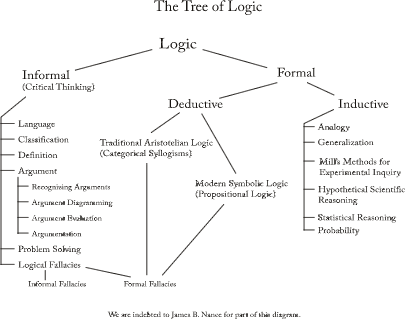 Which of these branches of logic should you study? Having studied parts of all of them, it is hard for us to recommend one over another. There is useful knowledge in all of them. But as our mother says, there is only so much time in the day. With that in mind, we would recommend starting with informal logic. Then, as you have time and inclination continue on into formal logic. The more branches of logic that you learn, the more useful tools-of-the-mind you will have under your belt. This material is taken from the booklet Learning Logic at Home and appeared in Homeschooling Today magazine, September-October 2003.